During November and December of 2018, five military families in each of 10 markets around the country were nominated and honored for their service. 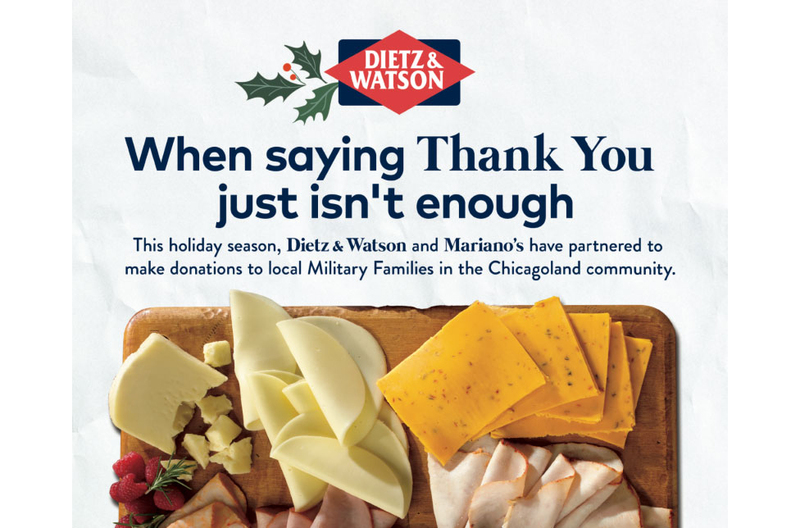 Each winner was awarded with a Dietz & Watson Chef Carved Ham or Party Deli Platter along with a gift card to their local grocery store for up to $150. The advertising and promotional plan included nearly 50 radio spots per week in each of the 10 markets to describe the program and contest and to drive traffic to the online contest nomination page. In addition, social media posts were executed twice a week per market to engage listeners and drive traffic to the online contest page across station social platforms. Five winners were selected at random from the web entries the week of Dec. 12 and were announced on air in mid-December and contacted by radio station personnel. Retail partners around the country included: ShopRite, Philadelphia; Mariano’s, Chicago; Safeway East, Washington, D.C.; Albertsons, Southern California; Safeway, Seattle and Portland; Dierberg’s, St. Louis, Missouri; and Food City in Johnson City, Chattanooga and Knoxville, Tennessee.